The HomeGround Anthology 1982-2012 – now published! … so Emmy Award winning actor Guy Pearce introduces HomeGround: The Kate Bush Magazine Anthology 1982-2012, a project we have worked on for over five years, and which we are delighted to say, is now available to order. 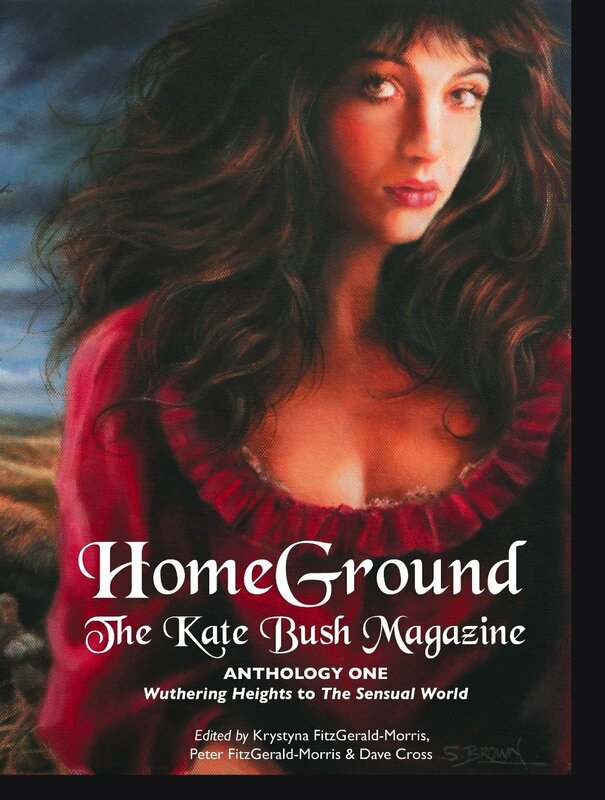 The first issue of HomeGround appeared in 1982, four years after Kate Bush’s dramatic debut with Wuthering Heights. Starting with an ancient manual typewriter, real scissors and a pot of genuine paste, we mounted articles on recycled backing sheets and added hand-drawn artwork to fill the gaps. 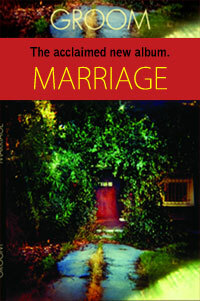 The first issue was photocopied, the pages hand-stapled together and twenty-five copies were given away to fans we knew. Only later did we discover the magic of word processing, and then desktop publishing. 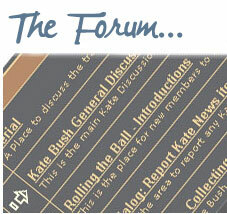 From those beginnings HomeGround became a cornerstone of the ‘Kate-speaking world’, going on to co-organise with the official fan club four fan conventions and events at which Kate Bush and members of her family and band appeared; arrange at her request a team of fans to be extras in two of her videos, and organise annual informal fan gatherings on Glastonbury Tor, and at Top Withens, the storm-blown ruin on Haworth Moor thought to be the place which inspired the creation of Emily Brontë’s Wuthering Heights. 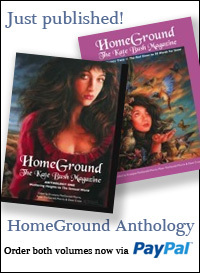 Years before the internet, HomeGround became a place where fans could discuss Kate’s music, and a place where they could publish creative writing and artwork inspired by that music. Built around the thread of HomeGround’s retracing of the scenes of Kate’s musical career, these unique books include material from over 400 HomeGround contributors from the thirty-year existence of the magazine, and include material inspired by all periods of Kate’s musical progression. This is a two-volume set published both in hardcover and paperback. Volume 1 covers Kate’s career from the late 1970s to the late 1980s – from before Wuthering Heights to The Sensual World and the box set set This Woman’s Work. 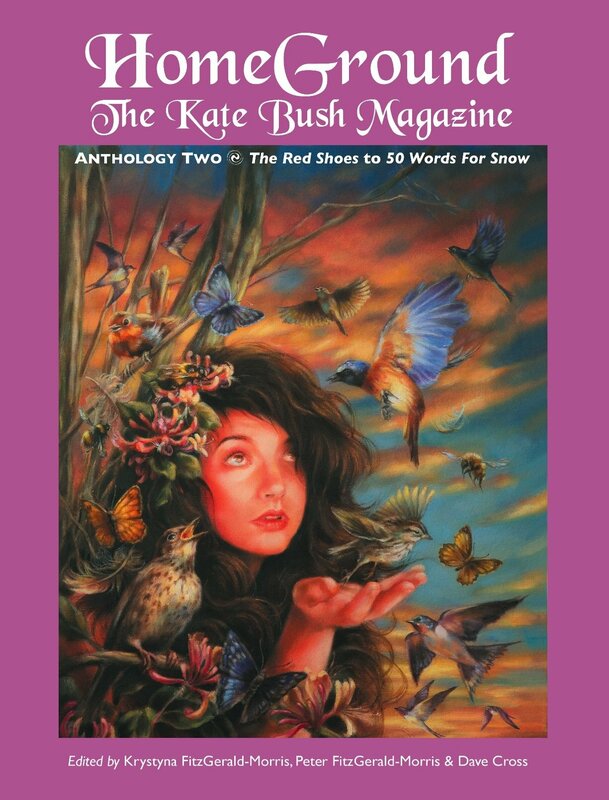 Volume 2 covers Kate’s career from the 1990s to date – from The Red Shoes to 2011’s 50 Words for Snow. Both volumes include a detailed Kate timeline and discography and a “who’s who” of people involved in the story. These volumes also contain a definitive collection of the beautiful Kate-related artwork from professional artists Paulina Stuckey-Cassidy and Steven Brown, the riotous Cosmic Kate graphic stories of Chris Tilley, the Kate-related extemporary photography of Rob Assenberg, Paul Camilleri, and Jules Angel and the work of published poets John Carder Bush, Collin Kelley, Kyla Clay-Fox, Antonello Saeli, and Jeff Side. Hardcover 648pp: ISBN 9781861714800. Paperback 648pp: ISBN 9781861714794. Hardcover 568pp: ISBN 9781861714824. Paperback 568pp: ISBN 9781861714817. Usual Retail Price: Hardcover: £49.99 / $81.99. Paperback: £34.99 / $57.99. If buying direct from Crescent Moon you can pay by cheque, money order or bank transfer, and shortly by PayPal. We hope very much that you will enjoy these volumes and that you will let us know what you think.